Occupy Wall Street, the peaceful protest against financial corruption and capitalism that started last month in New York City's financial capital, has already spread in many countries of the world. 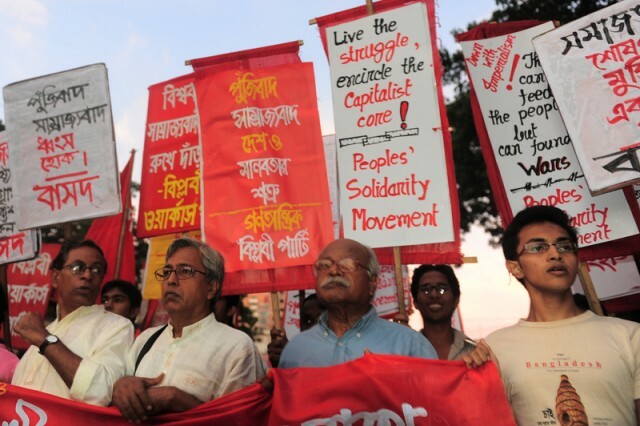 People have joined under the motto: “We are the 99% who will not tolerate the greed and corruption of the remaining 1%.” And the statement is also being resonated in some streets of Dhaka, the capital of Bangladesh. 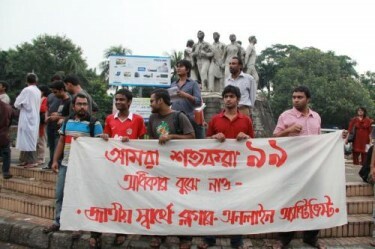 The People Solidarity Movement from Bangladesh gives solidarity to the global occupy Wall Street movement by holding a protest. We have to agree on the fact that the government should be more active and earnest in ensuring our livelihoods. We, the 99%, are outraged by the the long negligence and ignorance by the state and we are now building awareness. We have to avert violence. The greatest asset of the occupy wall street movement is their discipline, they have not resorted to violence in the past month. Soon more organizations joined the cause and planned a “Occupy Dhaka” [bn] movement on October 22, 2011 at Teacher and Student Center (TSC) square inside Dhaka University Campus which was promulgated using Facebook and Twitter. A placard. Image by Kowshik Ahmed. Used with permission. In every nation people are coming out in the streets chanting the same words. 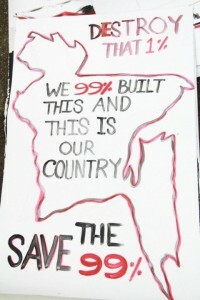 The slogan has two parts; one, identify ourselves: ‘We are 99%’. The other part; set the goal of the movement: ‘Occupy..’ Occupy what? Occupy the center of power, occupy your own country, occupy your own lives. In reality your lives, natural resources and country are being controlled by 1% looters, acquirers and war mongers. Our goal is to free those because we are pressed back at the wall. Changing the government keeping the power centers intact will not change anything. This is the learning from the US, This is the learning from Bangladesh, too. So people want to occupy the center of power. If the Bangladeshis want to live, build a new future, get themselves free from the two feuding, corrupt and occupier political alliances then they have to re-polarize the politics. 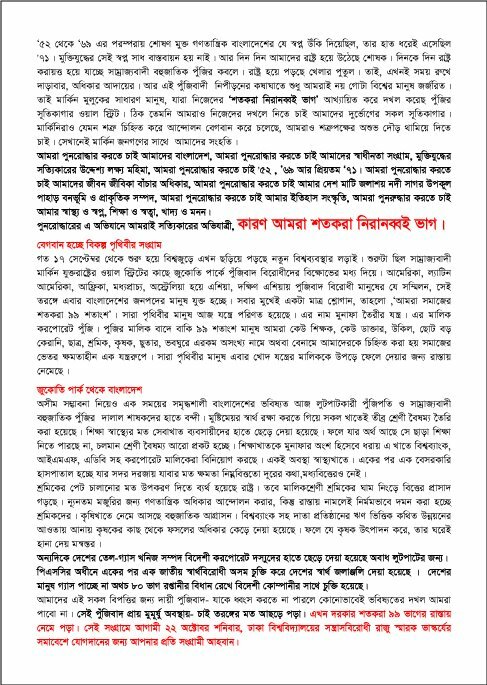 This struggle in Bangladesh is not new, if the citizens want that their country and the resources will be controlled by them then the slogan of the movement is applicable to them: We are the 99%, free Bangladesh from occupation. Kowshik Ahmed posts pictures of the protests in BDNews24blog and in a Facebook Album. He also posts a video showing the rally. Bloggers and online activists expressing solidarity at TSC. Image by Kowshik Ahmed. Used with permission. Thousands of people gathered in Wall Street to protest against Corporatism. Today Saturday a few hundreds of vocal Bangladeshi citizens expressed solidarity with that protest. [..] Today the left leaning politicians are in the fore front of this protest. But this place is not even theirs. This place is ours. This place is for those who are becoming aware by sharing the news and expressing themselves using the alternative media – blogs and Facebook. We do not share the ideology of the left, but we see the awareness in them. 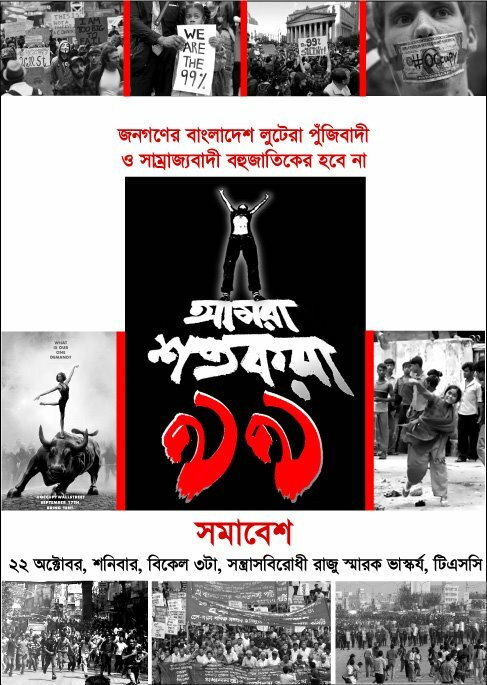 So we are with them in solidarity with the “Occupy Bangladesh” movement. We cannot tell whether these protests, these slogans and rallies will be successful. We do not know whether this movement of the new generation generating Godspeed by posting in Facebook or blogs will bring success in the coming days. But we believe in one thing. One day, the sleeping citizens will be awake. One day everybody will be in the streets. One day, instead of being a puppet of the 1%, the 99% will be on their own. That day they will rise and realize that we were before them. Our responsibility is to carry this movement till they wake up. Every day there are some 50-100 people on average joining discussions on what’s wrong and what should be changed. And also there are people in Maribor and Koper in the occupy movement. So – keep up the good job! Let’s free the Earth, together we can make it! And let’s not stop until one single person is not liberated!